Turkish cuisine is considered by many to be one of the classics. It has had a huge influence on food throughout Europe and encompasses all those elements that we praise these days: there is an emphasis on fresh produce, on seasonal vegetables, olive oil and fish but it also offers us those memorable sweets. The Turkish Cookbook is a guide to this cuisine. Turkish food is part the heritage of the cuisine of the Ottoman Empire, which encompasses Asian, Middle Eastern and Eastern European influences and has itself had an impact on neighbouring cuisines. Turkey is a large country which straddles Asia and Europe in both food and culture. The food, unsurprisingly, changes from region to region taking advantage of climate and geography. There is an abundance of fish along the coast while another area has favoured meat kebabs over seafood. Bulgur is a staple in some regions, while rice is ubiquitous in others. 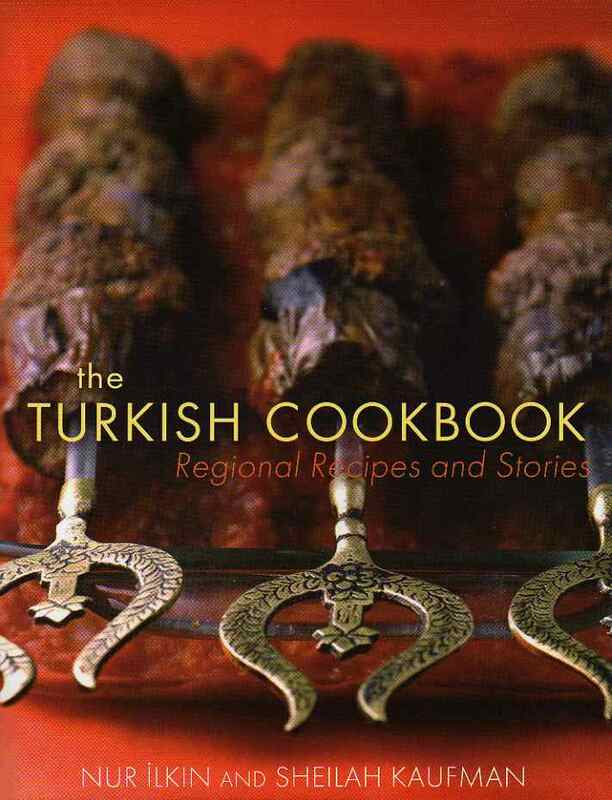 Authors Nur Ilkin and Sheilah Kaufman present us with a delightfully personal Turkish cookbook that explains the history of the cuisine, and they introduce us to the diverse cooking traditions of each of the regions. There is so much covered here that this is almost as much an inviting Turkish travelogue as a recipe book. There are a few dishes here that you might have tried on holiday and some that you may have tasted in restaurants, but there is much that will be new to the non-Turkish reader. Walnut and Red Pepper Spread (Muhammara) is a delicious dip and a change from the more common hummus. I would recommend that you roast the peppers before using in this simple recipe as it brings a richer flavour. We know we should eat more vegetables so a dessert that has carrots and nuts must count as one of your 5 a day. Carrot and Walnut Slices (Cezerye) are similar to Indian carrot halva but the addition of coconut and walnuts, which once again put in an appearance, make this a unique sweet for using up Christmas leftovers. A favourite savoury dish from this book is Stuffed Onions from the Black Sea region, another economic dish making the best of winter produce. The filling is of minced beef and rice seasoned with cinnamon and garlic with a little pomegranate molasses, which can be found in many Middle Eastern shops and some larger supermarkets these days. The Turkish Cookbook – Regional recipes and stories is a gift-quality cookbook that will tempt any lover of vibrant food into the kitchen, and probably onto the next flight to Istanbul. The dishes are simple to prepare and not over-spiced, and they are less celebrated than they deserve. Thank you Grub Street for another stunning volume.